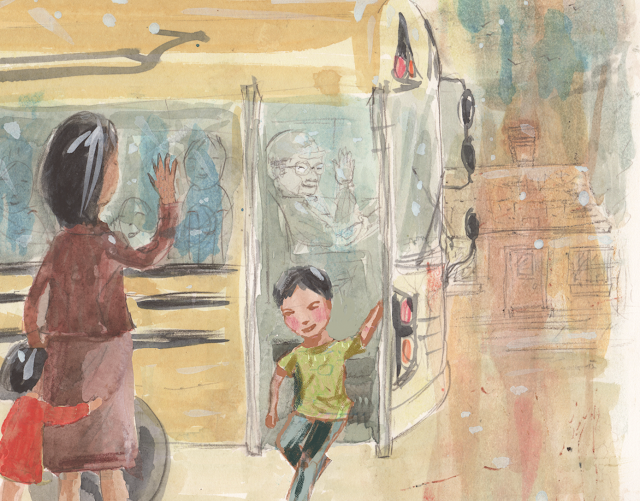 In this bilingual book, readers follow a bus driver picking up kids and dropping them off before and after school. 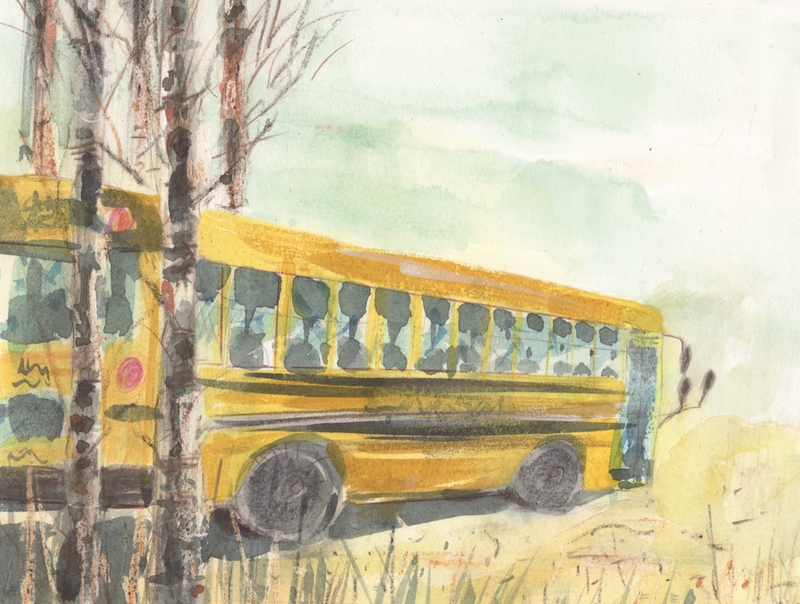 Like the students on the bus, readers quickly learn that the driver's native language is Cree, and he often speaks to them in his native language. Readers learn that "Nimoshom" means "my grandfather" and that "Ekosani" means thank you" as the author (of Cree descent herself) weaves Cree words into the text, and each new spread almost feels like a gentle wave: yes, we're subtlely learning new words, but it never feels strenuous or forced, rather it's calm and poetic. Like almost everything else I've ever talked about here, I was immediately drawn to the illustrations. They walk that fine line between being well-defined (usually because of color) and blurry, much like the text itself weaves together words we know and words we don't. Hibbard switches on and off between zooming in on scenes and zooming out, reminding readers that though we can experience this world we're seeing, we're not actually a part of it. This distance heightens that sense of awe we feel at learning more about Nimoshom, as though he's an untouchable character with some sort of power over us: we can't help but want to know more. And I know it's probably just me, but I crack up every time I see Nimoshom's face. He looks like Stan Lee! 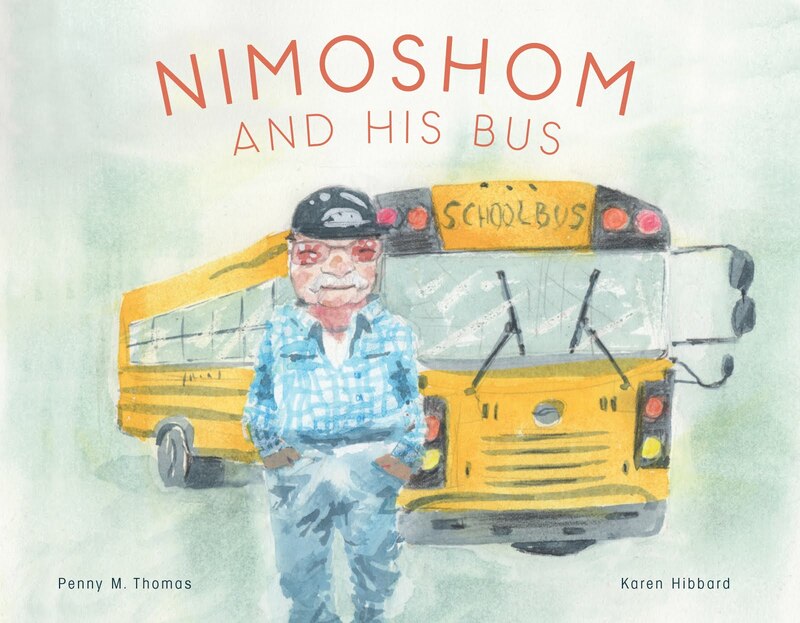 Nimoshom and His Bus publishes October 31 from Highwater Press! You should ask your school bus driver to take a detour so you can grab him/her a copy!